A Birthday to Die (Cut) For. It's time for our monthly 12 Kits of Occasion post, and I am the host this month. I decided to focus on birthdays and die cuts for my kit. I love making birthday cards, and they are by far the most common type of card I send out. I have so many fun birthday dies, many of which have not seen near enough use. I found some fun birthday paper from Pebbles, and chose my colors from that paper. I used a variety of stamps and dies from several different companies, including PTI (of course), Hero Arts, and Reverse Confetti. You can see a complete supply list under the heading 'Monthly Kit Supplies - 2015 on the 12 Kits of Occasions blog. Lindsey was kind enough to take a picture of the kit and create this photo collage. Well, I'll get right into it, because I have several photos, and I am eager to get around to everyone else to see what they have made with my kit. WOW ...feels like last week you guys did your previous 12 kits posts ...has a whole month really passed by ...unbelievable!!!!! Always such a joy to see what you have in your kits and to see all the great cards you make!!!! What a great kit you've put together and your cards are all simply wonderful!!!!! I think the first one with the inlaid pink letters and the cake is my fave!!!! 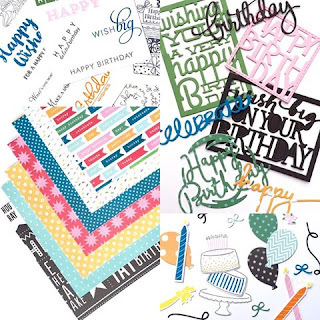 What a fun kit and a fabulous assortment of cards you've made! The party hat paper is super fun! You've put together a party in a package. ;0) How fun is that?? So much fun this month, Joyce! A great big 'thank you' for a fabulous kit. Loved everyone of your cards. More ideas for what's left over! Hugs! You put together one fabulous kit, Joyce! Your cards are beautiful! Joyce - Thank you so much for this wonderful kit! It was a real treat to work with and I made so many beautiful things! I love all your projects - MY MOST favorite is the poppy birthday die background with the RC cake. LOVE how you filled in only the HAPPY BIRTHDAY.. or is it the pink I love? LOL The candles are very clever too - all lined up and so colorful! Joyce...your cards are simply fabulous, but I knew they would be. Just love them all, so festive and so much fun. My favorite is your first card, just love that sweet cake. Thank you so much for the fantastic birthday kit...just love it! Joyce, your kit was awesome! You included so many dies I have had my eye on. Your cards are fabulous! I about died when I went to upload my card to the blog and saw that you and I had created almost the exact same card. Lol! I love your clever way of highlighting the sentiment in pink, though. Your last swirly card is my favorite. The way the colors blend together is amazing....I love it! Thanks for the super fun kit! The hostess with the mostest, Joyce. The most cards made with the kit, that is, at least that I've seen so far. You have such a wonderful array of birthday goodies and I'm glad you could share them in the kit. Looks like you were on a roll! Great and festive cards all! Like the oval die-cutted happy BD-diecut most; gives a great effect! Gorgeous line up of cards Joyce! Thank you so much for the fabulous kit, I had so much fun with it! Love your inlaid die cutting on the first card, the way you let your dies take centre stage on so many and my favourite is the last card with the two colours of watercolouring in the swirl--awesome! Joyce, thank you so much for such an amazing kit! I loved how easy and fun it was to work with. All of your cards are fantastic! Loved your wonderful pink design with the pretty cake and the sweet candle design the best but they are all awesome! Oh my!! These cards are amazing!! I LOVE the fun, clean looks of each card-even with all the layering!! Fantastic design! Thank you for a fun birthday kit ,Joyce! I made my cards as soon as I got the kit! I love the first card you made and was thinking I didn't get that background but I did :) . All your cards are amazing and the color on the last one looks great! I am afraid to mess that one up. Thanks again,I'm trying to catch up . I had SO MUCH fun with your kit Joyce!! I absolutely love your collection of birthday cards! !